Advantages: Compact and useful format for modellers; packed with helpfully captioned photos; attractive cover art - front and back; supporting narrative text. 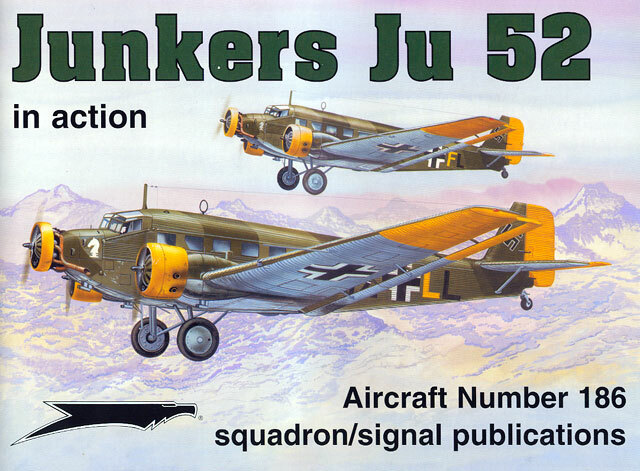 The Ju 52/3m (drei motoren - three engine) was the last and most famous of the Junkers family of corrugated metal monoplanes. Following a two-page introduction, the book describes the unsuccessful, single engine Ju 52 variants before moving on to the more familiar tri-motor Ju 52. Civil and military versions (including the seaplane) are covered in the section devoted to the development of the type. Operational service with Lufthansa, the Luftwaffe and post-war civil service complete this publication. This book follows Squadron/Signal’s popular “In Action” format with Don Greer cover art, two colour pages with ten colour profile as a “centrefold”, helpful line drawings and specifications spread over 50 pages in landscape format. As with the rest of the series, the real backbone of these books are the multitude of photographs packed between the covers. More than 90 photographs are captioned in detail. This is another interesting book in the "In Action" series. The timing is good with the reissue of the 1/48 scale Revell kit, the recent Eduard 1/144 scale model and some respectable offerings in 1/72 scale.